Gennady Golovkin 38-0-1 (34) is convinced Saul ‘Canelo’ Alvarez 49-1-2 (34) was juiced the first time they fought one year ago. “You can’t deny there was some injection marks,” Golovkin said. “On his arms there was some injection marks. I don’t know what it was but the injection marks were evidently there; everywhere, his biceps, his stomach, and pretty much everywhere. 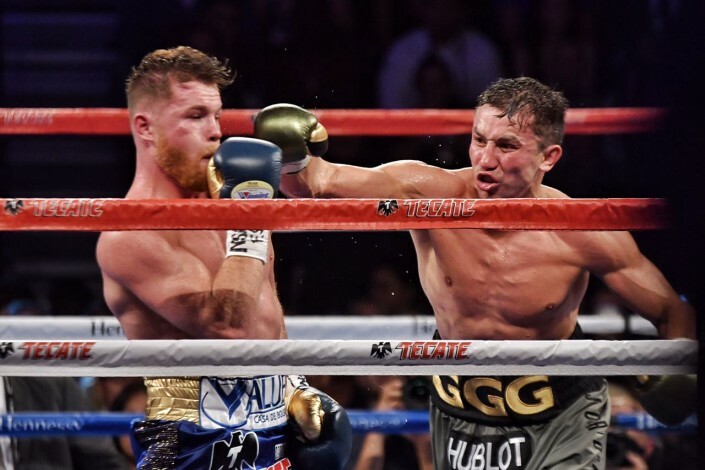 Alvarez has refuted Golovkin’s claims and promised to make a statement in their rematch for the Kazakh bomber’s WBC and WBA middleweight titles at the T-Mobile Arena in Las Vegas, Nevada this Saturday night. “I’m bothered by all the stupid things they’ve been saying,” he said. “I don’t know which one to laugh about or get angry about at this point but their statements are all excuses for the loss they will take this Saturday. “I have been using all of these statements as motivation for my fight on Saturday. I know that it can be dangerous to go in the ring with a hot head, but I have experience. Golovkin and Alvarez were scheduled to fight a rematch of their contentious September draw on May 5 until the 28-year-old Mexican turned in a pair of dirty drugs test for clenbuterol in February. Alvarez – who blamed tainted Mexican beef for the positive drug tests – was banned from boxing for six months.